The South as we love her is a land of tradition, a place where history is alive and old habits never die. Additionally, few will argue that many of our Nation’s best annual events, such as the Derby, the 500, SEC Football, Savannah St. Patty’s or Mardi gras, all occur in the Southland. As such we must admit to a bit of a tempestuous affair with those darn secessionists, but that doesn’t mean we’re beyond calling a spade a spade. If you’ve been lucky enough to visit in the past 5 years you no doubt noticed a few gentlemen in Croakies and polos. Yes, indeed, we speak of the army of Southern Bros that swarm across that beautifull, but erosion prone, red clay soil. The population of these frattabulous bowtying machines explodes in towns like Athens, Tuscaloosa, Auburn, Lexington, Oxford, Columbia and Knoxville. 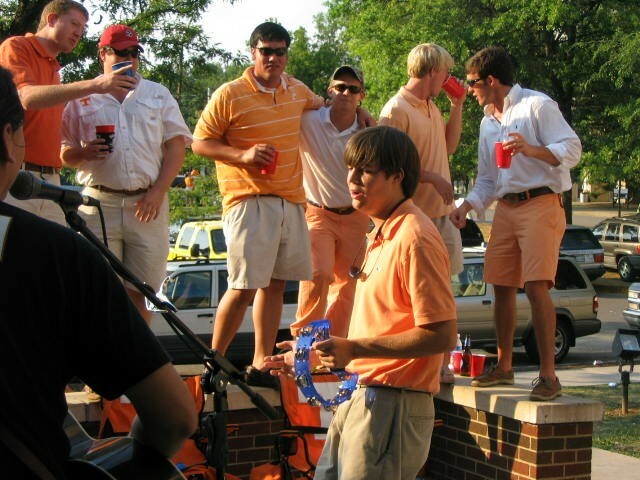 In fact, Knoxville was the location of the little bro-in pictured above (more brobourine bro, you’re losing the beat!). Various printed paraphernalia such as ties, bowties, pastel shorts, polos, caps or even croakies adorned with adorable marlins, bulldogs, cotton, palmettos, azaleas, crocodiles and the like. Oh how those belles may swoon. A well worn pair of docksiders, for sailing. The ubiquitous bro-cut mop-top swoop styled coiffed head of oh-so-flowing hair. Make sure not to get it in your eyes, and the choice between swooping right or swooping left is hightly critical. Bassmaster stickers on the bro-wagon. Gaggle of sorostitutes in tow. Should you be lucky enough to share a State with these brotherners make sure to stop into your nearest haberdashery and suit up, lest you be noticed for that carpet bag in your clutches.